Samsung and BlackBerry announced a strategic partnership. The deal will bring the Canadian company’s highly praised mobile security solutions to the Korean giant’s lineup of Android devices. The end result of the partnership between the two companies will be available in early 2015. 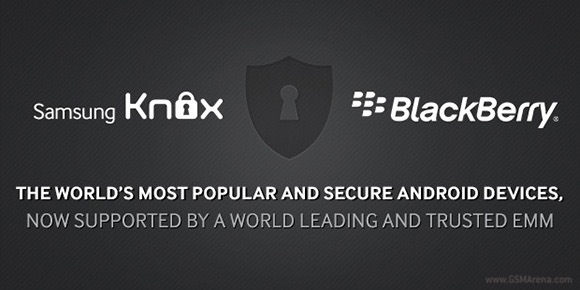 It will merge BlackBerry’s BES12 cross-platform EMM solution and Samsung’s KNOX into a single security suite for Galaxy smartphones and tablets. Samsung KNOX and BES12 will offer complete separation of business and personal data. The upcoming security suite will also provide enhancements that address some of the Android-specific security issues. The deal is a win for both parties. It will instantly make Samsung a major player on the enterprise market. BlackBerry on the other hand, will surely welcome the fresh stream of cash to its business. there is no perfect software design. Give me 1 example of a perfect unhackable open source software. can u do that? +1 to that. This is the most sane and sensible comment I've come across in GSMArena.